Not much to report on today. I’m closing in on 5 months post-op, and feeling fabulous. I have noticed that as the weeks go by, I am moving around so much more and wanting to move. This is an odd feeling. It’s not something I’m used to, but something I’m becoming more acutely aware of because I feel so much better when I’ve had exercise during the day. I’m looking forward to doing the Gobble Hobble next weekend. I’m going to go to the gym on Monday night and make a date with the treadmill so I can walk/run for at least 30 minutes there and see what my pace is. More tomorrow. Today began very early, and I was busy all day. It is time for sleep, as I won’t get to sleep in again until next Sunday. Eating today was all done away from home, as I was at a professional development workshop all day. I got in 91 grams of protein, but a higher amount of fat than I normally like (48 grams–boo). I did try to make good protein-packed choices though. And yes, I snuck in some potatoes. That’s a food I will never be able to give up. But I don’t eat a whole lot of them in favor of protein, so I’m not worried about eating them. Tomorrow marks 5 months since I began my weight loss journey in June, and I’ll take measurements tomorrow morning when I get up. I’m curious to see how many more inches I’ve lost. 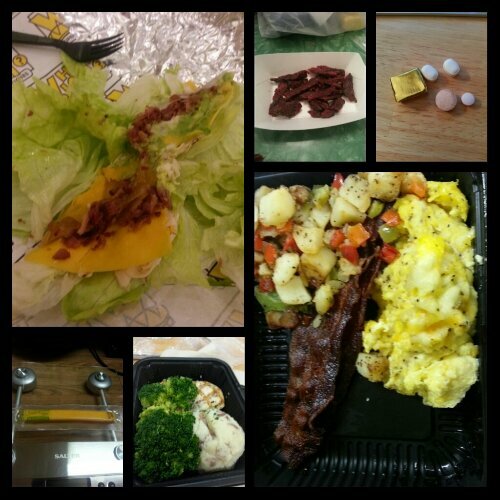 Today’s food choices, from upper right: multivitamin and calcium supplements x2, iron and B12 supplements; scrambled egg (I ate half), bacon and O’Brien potatoes (I ate two teaspoonfuls); grilled chicken breast, steamed broccoli and mashed potatoes (ate all the chicken, and a few bites of the broccoli and potatoes); Sargento reduced fat cheese stick; guts of a Which Wich lettuce wrap–sliced chicken, bacon, cheddar cheese, avocado, and caramelized onions; Jack Links peppered beef jerky. This entry was posted in daily bites, eating, post-op, the sleeve, vsg, weight loss surgery and tagged aspiring runner, benefits of wls, choices, daily bites, eating, exercise, post-op eating, post-op life, sleeve gastrectomy, VSG, vsg realness, WLS, workin' on my fitness. Bookmark the permalink.